Sorry about the lack of a post last week, but personal situations prevented me having the time. (No deaths, thankfully.) This post is still a couple of days later than I hoped to have it done by, but as I was testing the code I was going to blog about, I realised I was not content with the way it was written and so spent a little time rewriting it so that it worked more efficiently. That is now done and I am much happier with the way it works. So, without further ado, I now present to you the Death System and explain how it will work in Better The Demon. For players who invest time and energy into building a PC, the worst thing that can happen to them is to see their PC suddenly come to an untimely death. Whether it comes during battle, from a trap, or simply attrition, there is always that sinking feeling when you see your PC's HPs plummet to zero and they keel over dead. In NWN2, a system was introduced that meant a PC was not actually dead if someone in the party survived a battle. 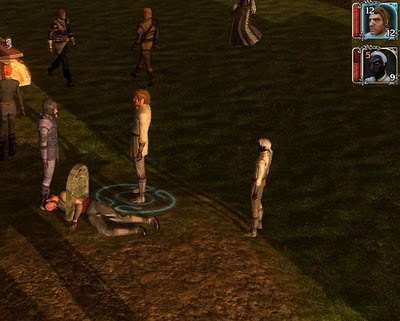 At the end of the battle, if there was a survivor in the party, all the PCs who had "fallen" would get back up as if they had only been knocked unconscious. While I have a degree of respect for this system, I do feel it robs the game of the impact of death, which became a lot harder to meet. For Better The Demon, I wanted to introduce an idea I had in mind since my early pen and paper days that helped in this sort of situation. This idea, however, could not be introduced until after the heroes had finished the Soul Shaker module, which is where this module begins. Part of the complexity with the Death System for my campaign is that I have introduced a couple of gaming elements that replace the standard system. The first and most complex element I have added is something I call the Life Essence. The second element is because, unlike SoZ, when a PC dies in my campaign they remain dead! Add to this that it also has to cope with a MP game (and overland maps) and the system becomes quite involved. I have written about this item even before this blog began, and have continued to write about it on and off over the course of this blog. (I first mentioned it three years ago in an old forum post on 30th August 2007, which I reposted in this blog here.) It is probably one of the most distinguishing elements introduced in the campaign that helps mark the new era. To begin with, the PCs will not know what this item is, but not too long after they begin their adventure, they will be introduced to an "understanding of life" and the Life Essence. I won't go into any more details about this in particular (I don't want to spoil the story), but will, instead, explain a little more how this new element helps alter the way the game plays. 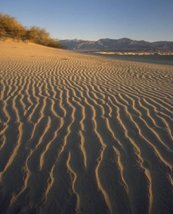 If, however, you would like to read a little more about the Life Essence, then also read this blog. The bottom line is that one use of the Life Essence is that it can be used to help protect a PC from untimely death, by offering Soul Protection. It also has some other very useful applications and so a player must decide on how they want to use this item in the game. 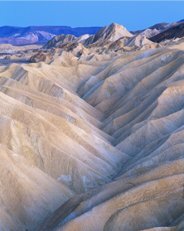 As they collect more of the Life Essence, so they may be more flexible with its use, but there is always a balance to keep. By default, Soul Protection is activated from the moment the PC understands its concept. From that moment on, when a PC dies, if they have enough Life Essence on them, they will immediately be reborn with full hit points and without any ailments. In combat, a PC will not even fall to the floor as the Life Essence sustains their life and keeps them from death. 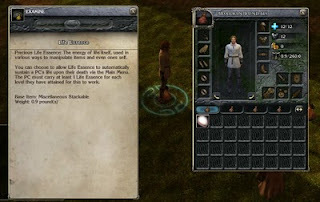 In game terms, one Life Essence is required for each level the PC has acquired. E.g. A first level fighter who dies carrying three Life Essences, will have one of them used up to enable rebirth, leaving them with two. Once the PC has run out of Life Essence, they will die in the normal way. NB: The term "rebirth" is used when a PC is respawned using Life Essences, as opposed to being "respawned" using the Main Death GUI. Because the Life Essence is valuable in other ways, the player has the option to determine if their PC resists the power of the Life Essence to have them be reborn or not. Resisting is more likely to be the case if somebody in the party has the ability to raise the PC from the dead in other ways, or can pay somebody else to do it. As the PC increases in level, the Life Essence may be better saved for uses other than Soul Protection. Some of the following pictures have been edited for ease of demonstration. Brent dies without carrying any Life Essences. (A tombstone is created alongside him.) Notice Brent is no longer in the party member bar on the right hand side. Clicking on the tombstone reveals Brent's body (that can be carried) and any items he was carrying(none in this example). 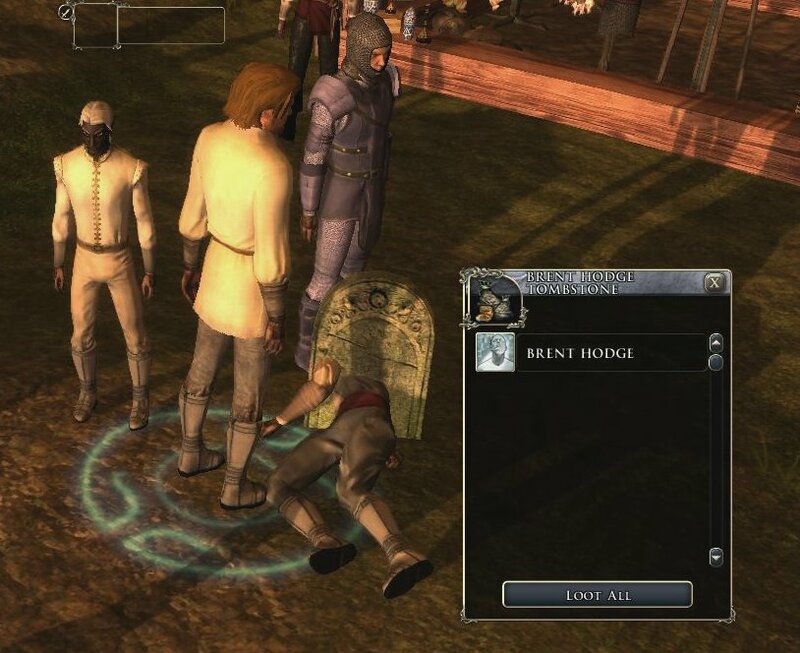 It would not show "plot items" he carried, as these would have automatically have been transferred to the Main PC upon his death (in case the player had chosen to abandon the companion). 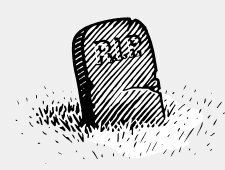 When Adaur dies carrying Life Essence, there is no tombstone - and because the player chose to have auto-rebirth turned off for this PC, the player must now stand next to the corpse to be offered a choice of Life Essence rebirth or to leave him for the time being. Notice, Adaur is also removed from the party member side bar when not using auto-rebirth. He will also have had any "plot items" he carried moved to the player's Main PC upon his death. 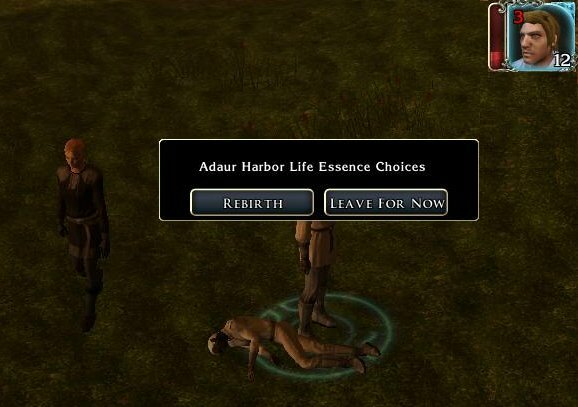 When the Main PC dies (Adarkin in this case), he will automatically be offered to be reborn if he carried sufficient Life Essences. 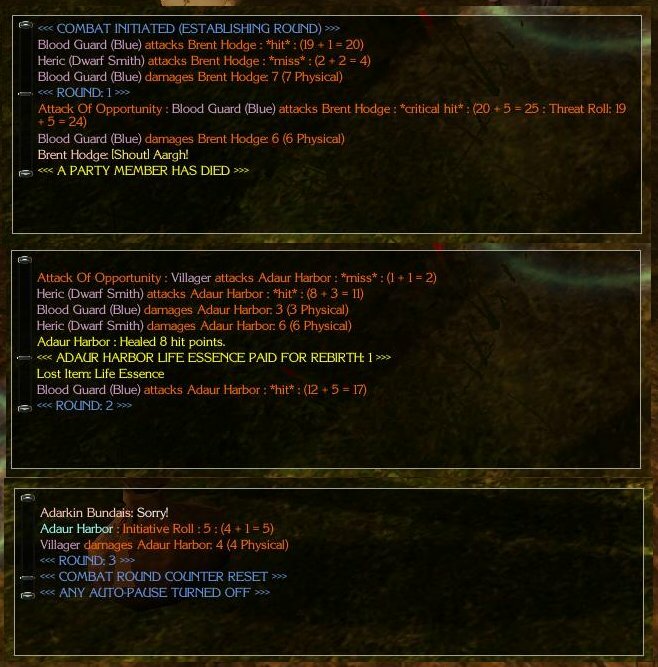 The player can choose to either rebirth using some of the Life Essences Adarkin carries or reload a game. 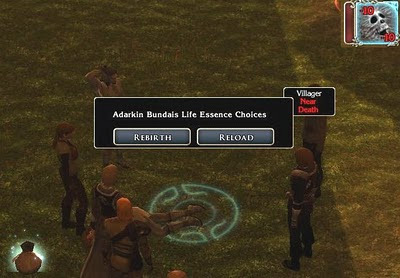 If the player had had auto-rebirth enabled for Adarkin, then the PC would have kept automatically respawning until he had run out of Life Essences. 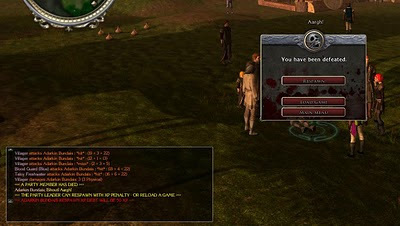 If the Main PC had died without any remaining companions to take control of or Life Essences to be reborn with, then the player is offered the Main Game Death menu and have the option to Respawn the Main PC, but with an XP penalty. 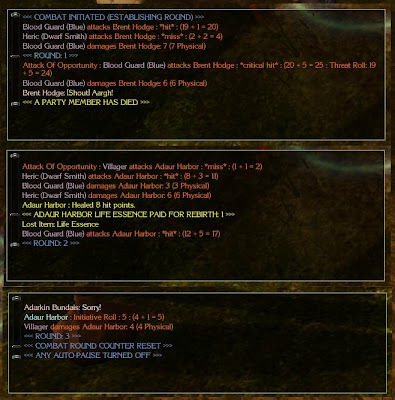 Above are some examples of the feedback during combat, including the turn counter. In the first window, it shows the combat being initiated (the establishing round, which may not be a complete round of actions), followed shortly after by Brent dying. (He had no Life Essences on him at all and so just died leaving a tombstone.) The second window shows a combat where Adaur did have auto-rebirth enabled and lost a Life Essence on a rebirth situation. The last window shows Adarkin "apologising" to stop all further combat that had been initiated. The "Sorry" option can only be used with "good" aligned NPCs who have been attacked "by mistake". The facility can only be used after a 30 second cool down period and there are also consequences for killing innocents "by mistake" or otherwise. In Better The Demon, an unprepared party can also die through attrition, especially in the early days when they do not have spells to support them. Even then, death by attrition is most likely to occur when the player decides to take his party on a long distance journey. There are circumstances when a party member will refuse to travel in the first place (when there is no means to supply food/water for the journey), but if travel is started, then the leader of the party (or the chosen leader for a group of players in a MP game) has the sole responsibility for all the PCs in the party. When a party enters overland travel, it is the leader who controls where the party travel, and it is only the leader of the party that the player directly controls. (In a MP game, only the lead player controls the direction of travel for all the players, just like SoZ.) It is possible for companions to die along the way through lack of food/water, and in such circumstances if they do not have Life Essence to revive them for a short while longer (and before they die again from lack of food and water), then they will die just as if they had in battle and leave a tombstone on the map that contains their body and items. The leader must then decide for the group if they intend to take the fallen companion with them or not. If the leader themselves dies, and they carry Life Essence, they will be revived automatically if set to do so or given the option to be reborn using Life Essences or reload a game. 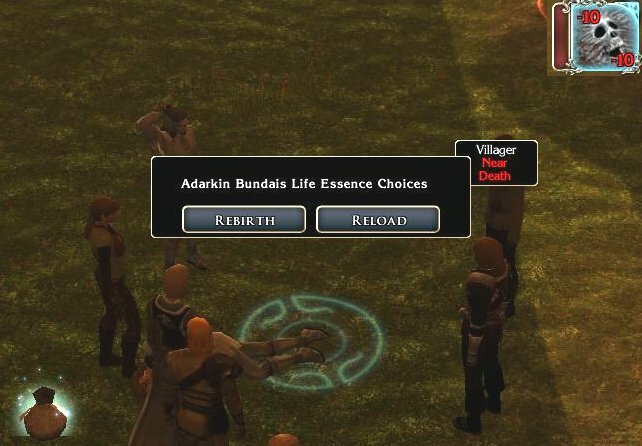 If they do not carry Life Essences, then they will only be given the option to reload a game at the official Death GUI. Basically, on an overland map, if the leader dies and does not have sufficient Life Essences to be reborn, then the party is considered "lost" and if there are any surviving companions at the time, then they are also considered dead. On an overland map, it makes sense to ensure the leader stays alive the longest for the sake of the party! "In Storms of Zehir (SoZ), a system was introduced that meant a PC was not actually dead if someone in the party survived a battle. At the end of the battle, if there was a survivor in the party, all the PCs who had "fallen" would get back up as if they had only been knocked unconscious." Ummmm, you meant the OC right? You know for some reason I thought it had only been with SoZ, but of course it wasn't. My bad. Thanks for the correction. I have now updated the blog to read correctly. I will ask the usual questions you expect from me: Why not just leave them dead and make the player raise them in town or via magic? You should really try on DA Toolset if you want to add infinitely to your work load. In serious discussion though, what is the benefit of all this, interesting as it is. Just a couple extra "quarters" rather than having to reload on death? Was that the central intent of this system? The main reason for this is because of the changes the party have previously brought about in the story - affecting the nature of life itself. (Soul Shaker was the start of the changes to the P.M.P.) However, the Life Essence was also something I wanted to include for other reasons other than this Soul Protection. Untimely death prevention is just one of its benefits. ;) The ability to have something like the Life Essence be able to bring you back to life is also a benefit to the PCs pockets as far as gold may be concerned. And as the economy has been restructured, this will also fit in with the campaign setting. What I've always found ridiculous along the vein of "falling unconcious instead of dying, no matter how hard you get it" is the very RPG concept of repeatedly being severely injured and healing and rinse and repeating multiple times a day. I mean, really, are we to believe that any adventurer wouldnt find a new profession if he was getting a new slash or 3 in the torso every battle? Would his body even stand up to more than 2 battles this way? If i were ever to make a "system" it would be a stamina system. It may not even work all that differently, but perhaps in the description. Hit points become stamina and reflect how long you can fight for. Defending from aggresive hits slowlys depletes it, and when your stamina reaches zero, is when actual injury kicks in. Something rare, rather than the rule. I have also included systems to prevent full HP recovery on a rest unless environments are good. Furthermore, I also have a "vigour" system, which is like a stamina system that prevents a PC from simply being able to wonder around for days without food (bought or created by magic). The life essences are a good idea--anything that makes the player step more carefully is a good thing. In the OC, with the "knocked out" system, I couldn't help but think death was just an inconvenience rather than something be feared/avoided. And, really, if player death isn't dangerous, than I'm not quite sure what world you're making. I do use a GetAheadLocation for the tombstone, but do not want to offset it too much in case I set the headstone in an inaccessible location to the player. In testing, the tombstone has been hard to click on if the offset is too high. I even had to turn dynamic collisions "off" to prevent the PC's body falling near/into the placeable and prevent it from being useable. Maybe it is something I can look at again later, as I too noticed the body half way through. It does not always happen, but when it does, it can look a little strange. This is an intersting idea and adds a bit more to death. One of the great features that SOZ provided was the bleeding and death system. The OC and MotB death truely was meaningless and I hate the respawn feature. For my campaign the respawn is disabled and I use the SOZ system. Since it is for a starting player death would normally be the end of the game, but to prevent player frustration I included a resurrect item. To discourage it's use it adds a xp penalty based on player level then increases that penalty based on the number of times it has been used on that one player. 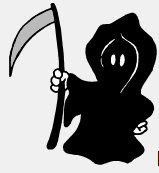 Death is soemthing that should be avoided as it is generaly a bad thing. A balance needs to be created to keep the player from wanting to die but not cause undue frustion. A little side thing: I was reminded of betrayal of Krondor with the mention of the effects of multiple serious injuries. While that game tried to create a realistic injury system it ended up skewing battles with only the first couple of rounds mattered. Once a player was more the 50% injured penalties where applied to their combat abilities and death was almost guarenteed. Ohhh poor Brent! Will the world ever be the same? I wonder what happens if a PC with no life essence dies while in an indoor location, such as the city's barracks. Would that create a tombstone besides the battle dummies? When a PC dies, they are removed from the party. They are dead and cannot recover like they would in the OC modules. Therefore, for a player to be able to have access to the dead PC's equipment, there needs to be a way for them to interact with them. Direct clicking is not possible anymore, so I created a headstone where all the PCs equipment goes (and the dead PC themselves). This then allows the player to take whatever they need from the dead PC. Basically, the headstone is a mechanics object allowing the player to interact with the dead PC. If the player takes the "dead PC item" from the headstone, they can place it on the ground elsewhere and the headstone moves to the new location indicating where the dead body now lays. Maybe it might be worth me doing a new blog going into more details and with pictures as well? As it is a new idea that players will need to know.